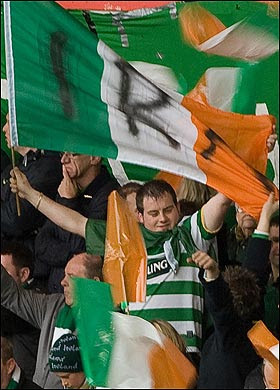 Celtic fan Aaron Laing appeared in Court yesterday for displaying a flag of terrorist group the IRA. He logged onto Celtic fan forum the huddle board under the avatar of henrik7cfc to tell everyone of the days proceedings. "I recieved a £500 fine and a 3 year football banning order for all matches in the UK. I am appalled at the banning order because I have basically no previous apart from driving offences. Sums up this country in one though. I havent spoken to my lawyer properly about an appeal but i will be looking into it. They are basically saying im a danger to a football match as i could cause a riot or a disturbance but they know by looking at me and my lack of criminal record to know thats not what i am like. The media has basically forced the court to act harshly in my opinion, the video evidence was poor and i couldnt have been properly identified either but i was told by my lawyer that the police would obviously just say it was me they saw so i had no choice other than plead guilty at todays trial. I am sick because the thought of it blowing over and getting to see celtic again was exciting but this has knocked it back a while. 16th september 2012, the clock is ticking."